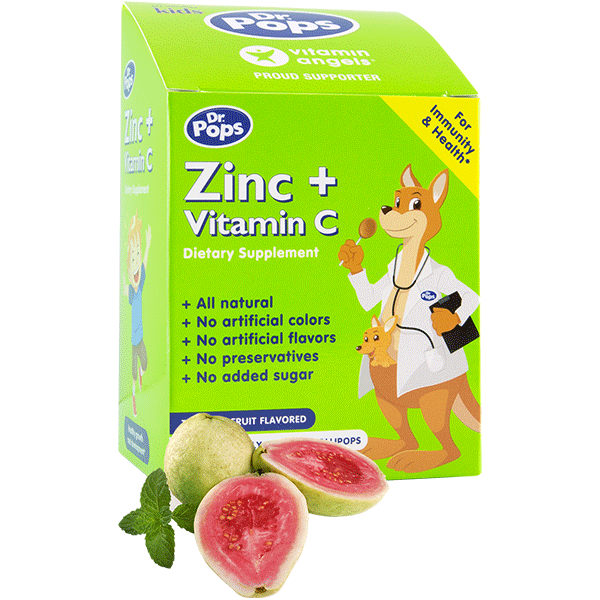 Dr Pops Zinc + Vitamin C lollipops​ ​are​ ​a​ ​delicious​ ​&​ ​healthy​ ​way​ ​to supplement​ ​a​ ​child’s​ ​daily​ ​Vitamin​ ​C​ ​and Zinc intake.​ ​Made​ ​with​ ​only​ ​real​ ​ingredients​ ​(organic guava extract, acerola​ ​(vitamin​ ​C),​ ​zinc, isomalt​ ​&​ ​natural orange oil),​ ​these​ ​soothing​ ​all-natural​ ​lozenges,​ ​originally from​ ​Australia,​ ​have​ ​no​ ​artificial​ ​colors,​ ​​no​ ​artificial​ ​flavors,​ ​no​ ​preservatives,​ ​and​ ​no added​ ​sugar. 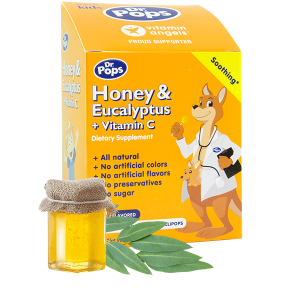 All​ ​natural,​ ​allergy-free​ ​vitamin​ ​lollipops​ ​for​ ​kids.​​ ​​Free​ ​from​ ​peanuts,​ ​tree​ ​nuts,​ ​eggs, sesame​ ​seeds,​ ​fish​ ​&​ ​shellfish,​ ​gluten,​ ​soy,​ ​wheat,​ ​alcohol​ ​&​ ​dairy. No​ ​artificial​ ​colors,​ ​no​ ​artificial​ ​flavors,​ ​no​ ​preservatives,​ ​no added​ ​sugar. 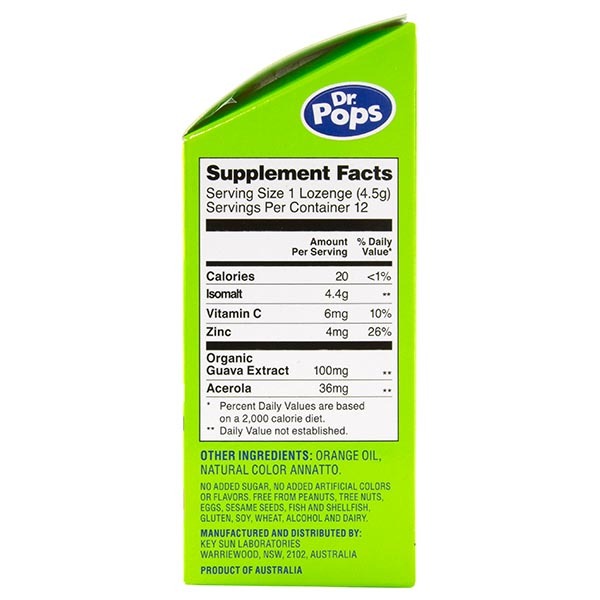 Dr​ ​Pops​ ​natural​ ​lollipops​​ ​are​ ​made​ ​with​ ​isomalt,​ ​a​ ​sugar​ ​substitute​ ​made​ ​from​ ​beet sugar​ ​that​ ​has​ ​only​ ​a​ ​small​ ​impact​ ​on​ ​blood​ ​sugar​ ​levels​ ​and​ ​does​ ​not​ ​promote​ ​tooth deca​y.​​ ​Each​ ​​Dr​ ​Pops​​ ​lollipop​ ​contains​ ​only​ ​20​ ​calories. 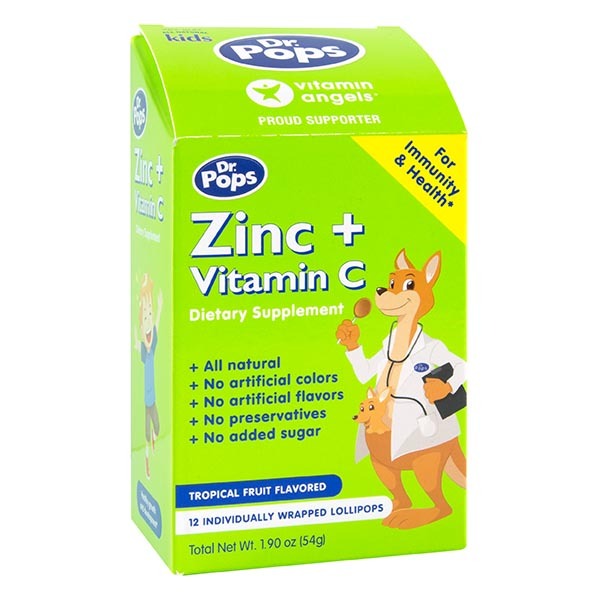 Tropical fruit​ ​flavored​ ​lozenges​​ ​are​ ​made​ ​with​ ​real​ ​ingredients;​ ​organic guava extract, acerola​ ​(vitamin​ ​C),​ ​zinc, isomalt​ ​&​ ​natural orange oil. 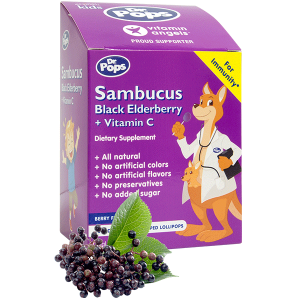 A​ ​yummy​ ​&​ ​healthy​ ​way​ ​to​ ​supplement​ ​a​ ​child’s​ ​daily​ ​vitamin​ ​C​ ​intake,​ ​to​ ​help​ ​boost their​ ​immune​ ​system​ ​and​ ​may​ ​be​ ​used​ ​as​ ​a​ ​natural​ ​remedy​ ​to​ ​help​ ​soothe​ ​a​ ​sore throat. 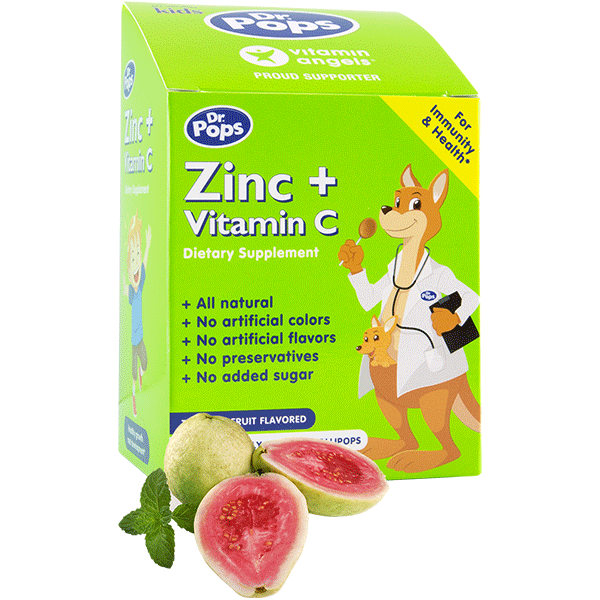 Dr​ ​Pops​ ​Zinc + Vitamin C lollipops​​ ​are​ ​vegetarian and suggested​ ​for​ ​kids​ ​older​ ​than​ ​12​ ​months. Store in a cool, dry place below 85ºF. 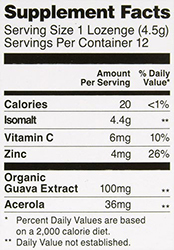 Excess consumption of foods containing Isomalt may have a laxative effect. Lollipops are a choking hazard. They should only be given to children under supervision. Orange oil, natural color annato. 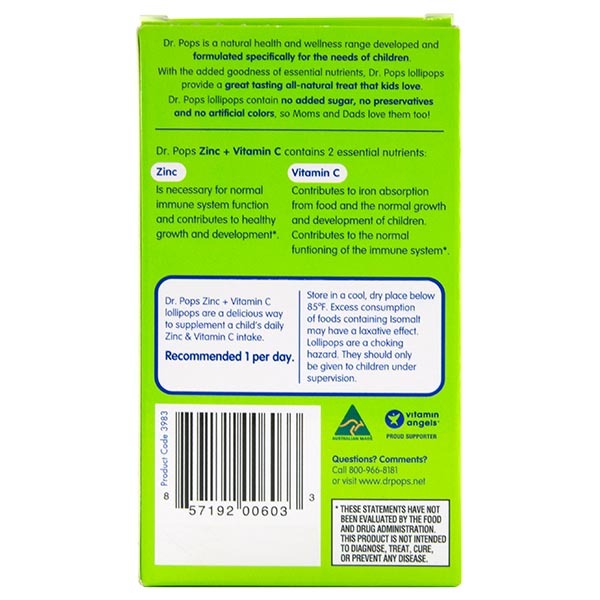 No added sugar, no added artificial colors or flavors, free from peanuts, tree nuts, eggs, sesame seed, fish and shellfish, gluten, soy, wheat, alcohol and dairy.